All iPad's are fully tested and in perfect working order. Need an Apple box for a gift etc?. Link below. Overall I'd say Grade A (Excellent condition). Fully working. Mint all around. may have odd signs of use. A fully working iPad. All iPad's are fully tested and in perfect working order. Need an Apple box for a gift etc?. Link below. Overall I'd say Grade A-B (Good condition). FREE 12 Month Warranty. 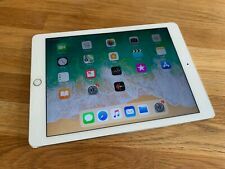 Apple iPad Air 2 128GB, Wi-Fi Cellular ( Factory Unlocked), 9.7in - Gold in MINT condition, comes in original box with original charger and wire. The screen is cracked (see photos), so the unit is probably best used for parts. All iPad's are fully tested and in perfect working order. Need an Apple box for a gift etc?. Link below. Looks mint all around. May have 1-2 faint signs of use. Overall I'd say Grade A- (Excellent condition). Apple iPad Air 2 128GB, Wi-Fi, 9.7in - Gold in immaculate condition. Had case and screen protector on since purchase. Comes with all accessories and box plus case. I may have more screen protectors, so will also send if I find them. Dispatched with Royal Mail next day tracked delivery. Software is up to date, smoke free home and one very, very careful owner. Only selling as I have ordered the new one. Please look at pictures, I've tried to cover back and front and also sides and bottom and top so you can see the scratch free condition. Thanks for viewing. 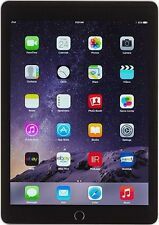 New listingApple iPad Air 2 128GB, Wi-Fi, 9.7in - Space Grey | FLAWLESS! Condition is Used. Bought in 2016 for studying, but no longer used. I have always had a screen protector and case so this is flawless! 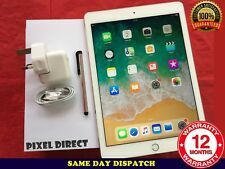 5 out of 5 stars - Apple iPad Air 2 128GB, Wi-Fi, 9.7in - Space Grey | FLAWLESS! 53 product ratings53 product ratings - Apple iPad Air 2 128GB, Wi-Fi, 9.7in - Space Grey | FLAWLESS! WiFi only. Used but in good condition. Apple iPad Air 2 128GB, Wi-Fi, 9.7in - Silver With Cracked Screen. Condition is Used. Dispatched with Royal Mail 2nd Class. Apple iPad Air 2 128GB, Wi-Fi, 9.7in - Space Grey. Always kept in protective case and cover. Excellent condition, full working order. Comes with box, charger and charging cable. Only selling as I’ve upgraded. Apple iPad 4th Gen. 128GB, Wi-Fi, 9.7in - Black. Dispatched with Royal Mail 1st Class. This is a used iPad but is like new, it was a present to a Grandparent who couldn’t use it and was sat in a draw for the majority of the time. It comes with a sleek black case and the original charger, unfortunately no box but it will be packaged very safely. 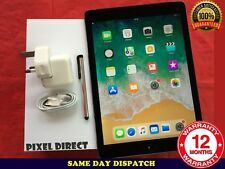 Apple iPad Air 2 128GB, Wi-Fi, 9.7in - Space Grey *Good As New No Scratches*. Only used on the train to watch BBC iPlayer and the iPad has sat in a protective case since I bought it. No viable scratches. It’s as god as new. Dispatched with Royal Mail 1st Class. Any questions or close up pictures, please drop me a message. A used, but in good condition Apple iPad Air 2 128GB and cellular in Gold. Comes with glass screen protector already installed, original box and manual. It has the original charger plug but no wire. I am also providing a a padded travel pouch in black and two covers one clear silicon and one stripped cover with stand. Please see photos. Please feel to ask questions or request photos. Free delivery. Cellular unlocked (Works with any network sim). 128 GB APPLE IPAD AIR 2. Space grey. But honestly once in use you won't notice any of it. You'll just enjoy using your iPad. In fine condition - one slight dent on side, Screen in very good condition. Slight bump at back. See photos. A fully working iPad. Mint screen, maybe odd signs of use. All iPad's are fully tested and in perfect working order. Need an Apple box for a gift etc?. Link below. FREE 12 Month Warranty. 12 Month Warranty. IPad Air 2 is just 6.1mm thin and weighs just 437 grams. iPad Air 2 128GB Wi-Fi- Space Grey. The device is not locked any Apple ID or Password. And new Quick Type features on the onscreen keyboard make formatting and text selection even easier and put shortcuts right at your finger prints.A much thinner,lighter and sleek design with Space Grey finish. IPAD AIR 2 128GB SILVER WIFI. iPad Air 2 Wi-Fi. IPad looks new, condition is very good, just has about 4-6 very small dark spots, they're so small that you can't really see them. Ipad has no dents. iPad works perfectly, including fingerprint ID. Processor family Apple. 3G standards EVDO, HSDPA, HSPA, HSPA , UMTS. Voice call Yes. Depth 6.1 mm. Top Wi-Fi standard IEEE 802.11ac. Photo Booth. Cables included Lightning. Keyboard supplied No. Apple ipad Air 2 Wifi Cellular 128gb. Condition is Manufacturer refurbished. Dispatched with Royal Mail 2nd Class, signed for. Some general wear and tear on housing but overall in a very good condition. Thank you for looking. Apple iPad Air 2 128 GB, Wi-Fi, 9.7in, Space Grey. iPad has no scratches or marks on screen and back. iPad is not locked to iCloud account. Overall good condition. Apple iPad Air 2 - 128GB - WiFi A1566. find my ipad is OFF. Top of the Range iPad Air 2 128gb as new condition Not a mark scratch on it unlocked Wifi and Cellular Touch ID Comes in original apple box along with charger sim pin Jison case Happy for buyer to pick up Any questions please mob 07964771258 or message through eBay Note delivery will be Royal Mail next day by 1pm signed for upto £500 compensation grab a great IPad you won’t be disappointed check out my 100% feedback happy days and thanks for looking.will end auction on 8 April at midnight if a buy it now will include a 2nd new Jison cover still in sealed box colour Brown thanks for looking. 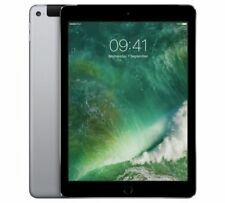 IPad Air 2 128GB Wi-Fi 9.7 in Display- Space Grey - UK Model. iPad Air 2 128GB- Wi-Fi- Black. Connectivity to computers, if desired, and power is provided by the Lightning port.The battery life of this iPad Air 2 model is reportedly 10 hours "surfing the web on Wi-Fi,watching video or listening to music. IPad Air 2 128GB. Space Ref 1144. 128GB WiFi. Screen password will be there until you receive the item then I will give it to you. This is to avoid other people can use it. Apple iPad Air 2 128GB 4G UnlockedGOLD. WiFi and Cellular (Unlocked/Sim Free). Afully working iPad. All iPad's are fully tested and in perfect working order. Need an Apple box for a gift etc?. Link below. A GRADE ,WIFI CELLULAR ,TOUCH ID ,6 MONTH WARRANTY ,IN PERFECT WORKING CONDITON (may have hairline scratches). iPad Air 2 Wi-Fi 128GB - Gold. IPad has always been about the display. Because Apple reduced the width of the device, along with the bezels on the sides of the display. So your content fills your view more than ever. With a 2048x1536 resolution and over 3.1 million pixels, photos and videos shine with detail and text looks razor sharp. I'm using this tablet for 2 years and it's in great condition it's coming just with charger I don't have the box. IPad Air 2 128GB Silver, Wi-Fi only version (no sim card support). No box, accessories or charging cable, iPad only. 3 month warranty. All scams are forwarded to the police. No exceptions.